What if the Zombie Apocalypse failed? What if the miracle of science saved both the survivors and those that were turned? I know what you are thinking: why in the world do we need yet another brand-new zombie flick? Stop right there with those EVIL thoughts, my friends. This one is different. Roll through the stereotypes of the zombie flick. Sleepers, walkers, etc. We get it, right? America might be a little tired of zombies. I get it. But allow me to introduce you to a world where zombies - let’s call them necro sapiens - co-exist alongside us. They go to parks, they marry, they vote, they are in the office. They even teach and run for office. Think of it: zombies with good dental plans. OMG, hilarious, right? Now, you see just where What Doesn't Kill Us is headed. 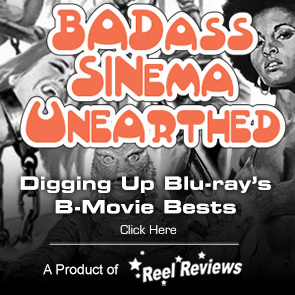 "It is righteously funny, consecutively on-point, and filled with so many inspired scenes of hilarity that it is sure to be a top 10 cult favorite in the coming months." And then think of how we, the non-zombied, might treat those that, through science, have been reintroduced into society but still look like zombies . . .
. . . which makes this independently-made mockumentary pretty damn essential viewing. It is, in fact, one of the freshest comedies that I have seen in the last couple of years. In it, we see rehabilitated zombies facing the adversities of living in a time when these creatures aren’t yet considered socially equal. Their struggles are hilariously legit and it all began with the Fugu Crisis, an epidemic that resulted in 5000 deaths. 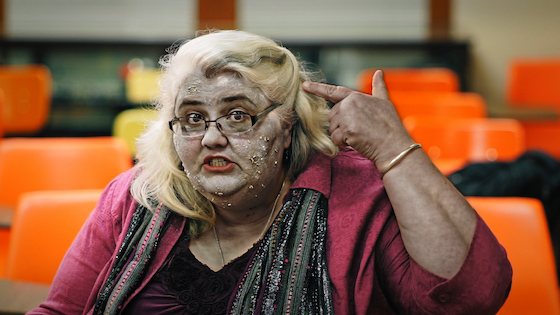 In this flick, filmmakers Zach Schlapkol, Ethan Cartwright, and Jacob Kiesling, go to East Texas and interview surviving zombies of the once thriving zombie apocalypse. We start with Keith (played by Peyton Paulette), Jeremy (played by Richard Scott Jr.), Bridgett (played by Tevia Loeser), and Noah (played by Russell Hightower) and then move on to other survivors and hear about their grievances with living alongside us. The ups, the downs, and all the chaos in between . . . These random interviews of zombies who have been “saved” come across like the better episodes of The Office. There are a lot of layers going on in the scene and with what is being spoken. And the insight into our behaviors are perfect. The necro sapiens, saved from the zombie virus but still looking a lot like zombies, are tired of how people treat them in society, list their complaints. It is an opening sequence that is both hilarious and filled with a ton of flip-the-script moments as zombies list out the stereotypes of their behaviors that Hollywood has already filled our heads with. As we move through the lives of these necro sapiens, we see them in office settings, working alongside humans and how they are treated in social settings. The whole thing is hilarious and, should you think this film is a one trick joke, relax. The whole thing is a brilliant send-up of the human condition. 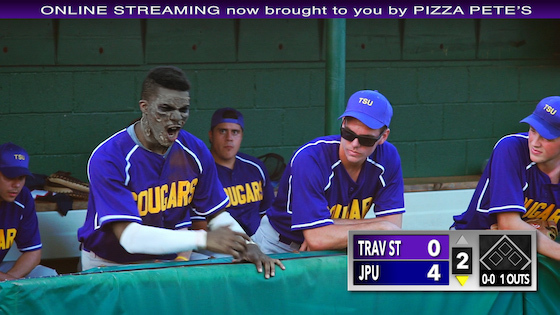 From the first necro sapien baseball player to the married couple riffing on domestication with the zombie virus, the independent film is a total comedic blast from beginning to end. Hell, we even get a look at the Fugu Crisis and the violent attacks that originally created this situation. So, for all you Zombie-heads out there, this film does not disappoint. The film tackles voter registration, religious beliefs, and doesn’t dare back away from the violence that comes with all these zombie fellas. It is righteously funny, consecutively on-point, and filled with so many inspired scenes of hilarity that it is sure to be a top 10 cult favorite in the coming months. The best way to keep up with the film right now is to check out its website, which is located here http://wdkumovie.com/and follow the film’s facebook (www.facebook.com/WDKUmovie/) and twitter (https://twitter.com/WDKUmovie) accounts. Only a select few are able to screen the film in its entirety right now, but the film is damned hilarious, making its 90-minute running time feel like a cool 10-minutes. Fun, breezy, and always lit, What Doesn’t Kill Us shows us life after a failed zombie apocalypse and the social situations therein, as zombies and humans must live together, are quite hilarious. Tagline: Being dead was way easier. Memorable Movie Quote: "East Texas. Where the bible belt begins, and all your problems end." 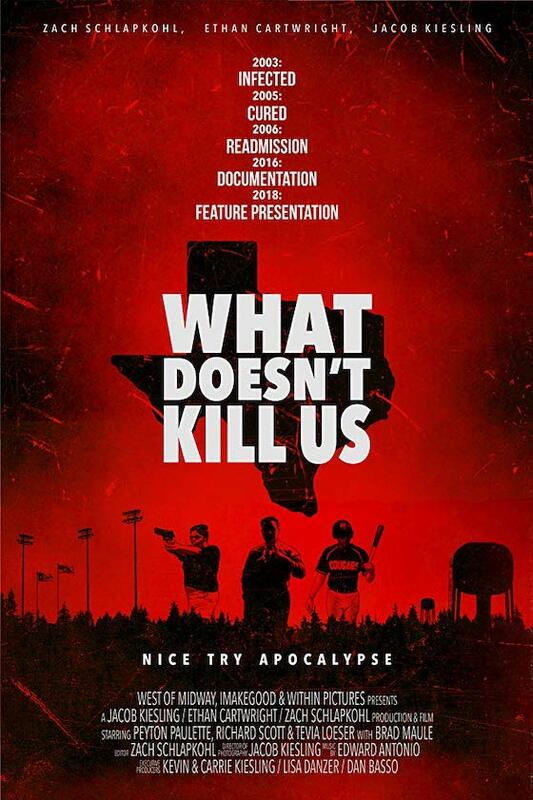 Synopsis: What Doesn’t Kill Us is a mockumentary about rehabilitated zombies facing the adversities of living in a time when they aren’t yet considered socially equal.